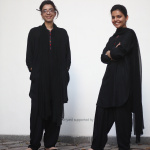 Rabbya Naseer and Hurmat ul Ain are interdisciplinary artists from National College of Arts (NCA), Lahore. Their work explores areas of painting, sculpture, photography, video and performance. They have been working collaboratively, since 2008 in Pakistan and continued in USA, where they both went to the School of Art Institute Chicago (SAIC), as Fulbright scholars. Their work has been shown at several places in Pakistan and internationally at Today Art Museum (Beijing), Fukuoka Asian Art Triennale (Japan), JamJar (Dubai), Chicago, Ikon Gallery (UK) and Khoj (Delhi).